One of three winners in the International Press Institute’s News Innovation Contest 2011, the co-convenor of the Digital Editors Network plans to use his funding to support news entrepreneurs. 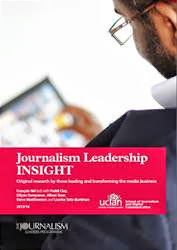 François Nel, Director of the Journalism Leaders Programme at UCLan, beat off stiff competition from 300 other projects, to be named as one of only three winners who will share a $600, 000 grant from Googlefor projects in across Mali, Turkey, France, the Netherlands and the UK. Nel said he will use his grant to launch the Media And Digital Enterprise (MADE) project, which aims to equip digital innovators in the UK and Turkey with the cutting-edge knowledge and skills required to start up and sustain innovative new journalistic enterprises in the public interest. “With easy access to new and cheap technology, starting up a new media enterprise is pretty straightforward; keeping it up is much more complex," said Nel. "That’s the key challenge MADE will tackle."